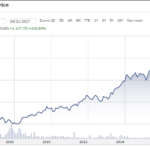 Many great investors like Buffett, Bogle, Lynch have been consistent in their advice that a low cost index fund is a very good investing option for a vast majority of the investors. This advice was at the top of my mind when I began my search for an equity mutual fund to start a long term systematic investment plan. A study from BofA-ML had found that only 3 % of the 1,600 equity funds actually managed to outperform the Nifty in first six months of 2018. A 6 % of them managed to outperform Nifty on a relative basis in the last one year and only 16 % outperformed the benchmark in the last three years. This set me thinking as to what this really meant for ordinary investors like you and me. Are there any equity funds which have been consistently outperforming the benchmark indices over for a very long time horizon? Or should we just heed to the advice of the investing legends and join the index fund investing bandwagon? 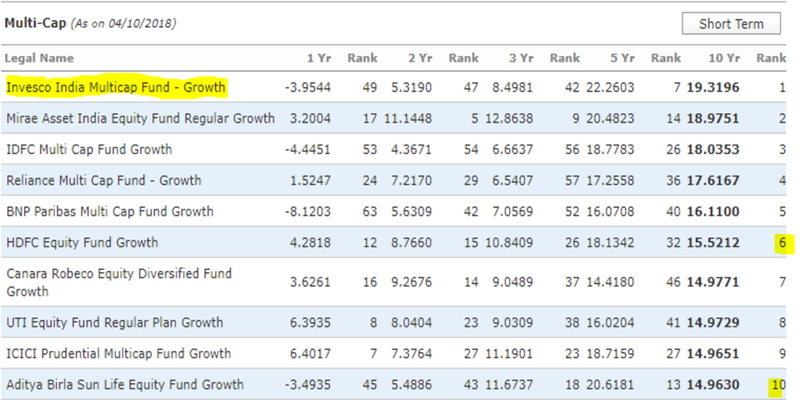 My search for funds to invest duly began by looking for the past performance data. 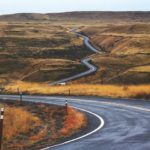 I quickly found that the data for recent periods seem to be readily available but the information became progressively scarce as I looked farther in the past. The maximum tenure for which I could find the performance data was for a 10 year period. 10 years is definitely a long time frame but I believed that even the 10 years time horizon missed two crucial financial events: the tech bubble of the year 2000 and the financial crisis of early 2008. I reasoned that any fund which has outperformed over 15 to 20 years would have had to pass either one or both of these two very difficult tests. And those that have come out in flying colors surely have proved their mettle and stood the test of time. Hence they may have a better chance of having success even going forward. But what about the data for more than 10 years? Thanks to Larissa and Himanshu at Morningstar, I could get the performance data for 15 years and 20 years. I spent many hours studying the data to find my answers. Hopefully my search for answers will also provide you with some food for thought. Over a long period the general wisdom is that equity as an asset class tends to do better. Hence the focus was restricted to pure equity funds and even within equity funds the scope was further narrowed down to the relatively less volatile large cap funds. 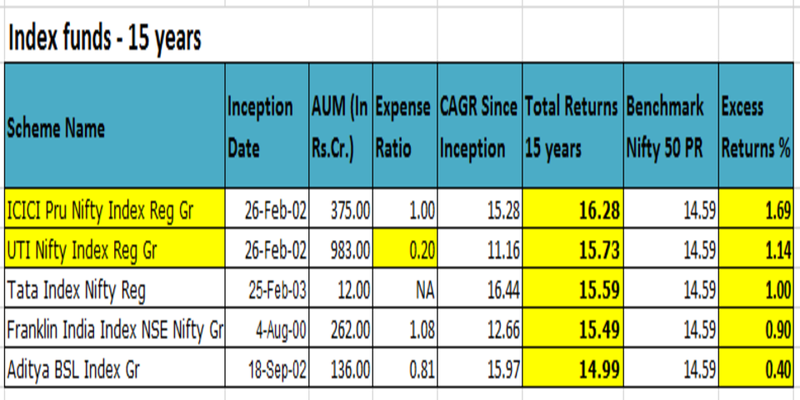 Pure Mid-cap, Small-cap, thematic funds were kept out of the scope. The goal was to build a corpus and hence only growth funds were considered. To focus on funds with a reasonable size, the minimum AUM requirement was pegged at 500 crores. The funds discussed here are not any recommendations to buy or sell. Please contact a registered Investment adviser before taking your buy / sell decisions. My findings are posted here for educational and informational purposes only. There is no reason to believe that the underlying data is not accurate. However, no guarantee is possible towards that end. The search is a endeavor to find a suitable fund to invest based on my set of criteria which may or may not be applicable for you nor be the best criteria to decide. E.g. Pure thematic funds or pure sector specific funds were not considered since they were considered to be inherently more risky. I am fully cognizant of the fact that past performance is NO guarantee that the future returns may also follow the same pattern. But I strongly believe that funds who have done well for 15 or 20 years have a greater chance of doing well in the future too. 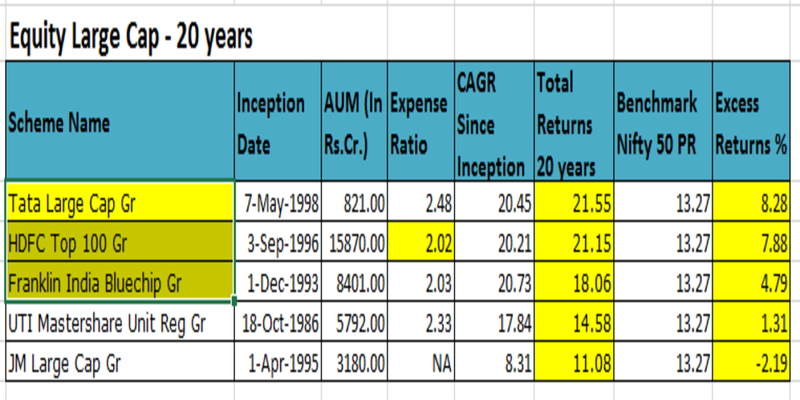 There are other factors too which are pertinent like the fund expense ratio, fund manager’s style , Fund house etc. which has not been explicitly considered in this exercise. All set, let us dive straight into the findings. 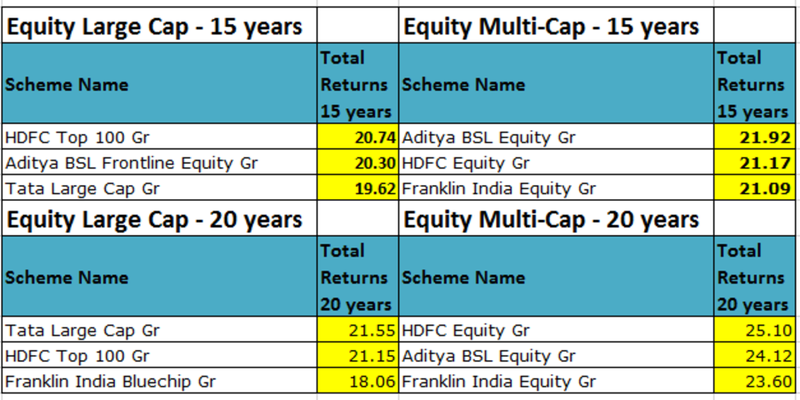 HDFC Top 100 and Aditya Birla SL Frontline equity fund are the big daddies out there- both in AUM and in performance. A 6% approx. out-performance is massive. Tata’s don’t market their cars well and that seems to be the same theme here with their funds too. 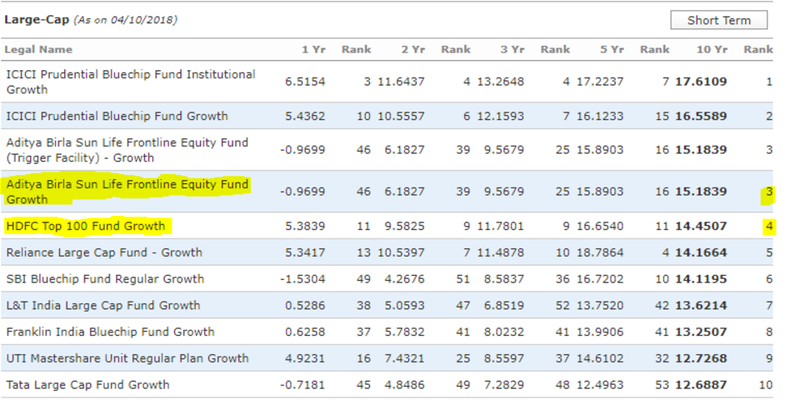 Their AUM is only 5% of the second ranked HDFC Top 100 fund’s AUM. The next crucial question was how the index funds performed. I looked at the 15 years data as on 31st Aug, 2018 to come up with the top 5. A quick look at 10 year performance validates the above choices. 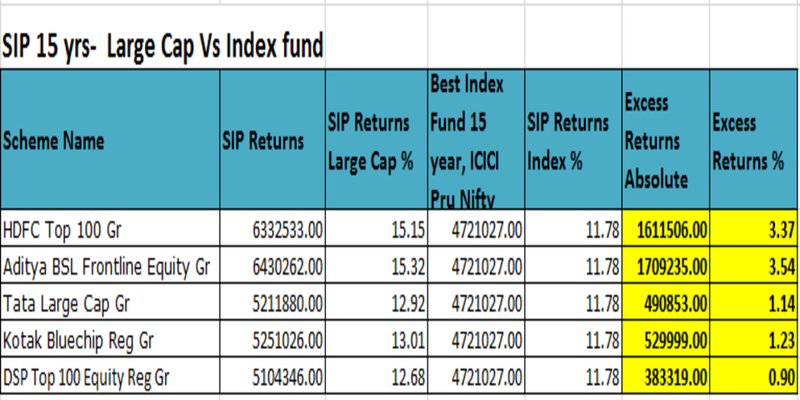 The top 3 funds namely HDFC Top 100, Aditya Birla SL Frontline and Tata Large cap fund continue their out-performance even for a 10 year time horizon to be in Top 10. 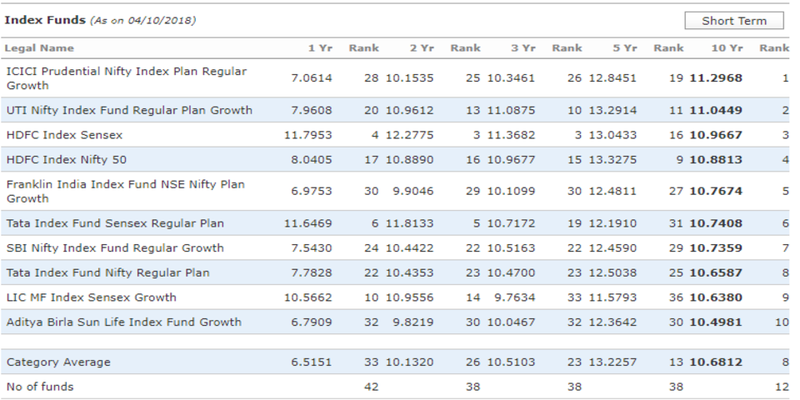 A quick look at 10 years performance validates the above choices. The question which was in the top of my mind was answered emphatically. In the debate of active vs passive investing, at least in the Indian context, I do not have any more doubt. The top performing funds have beaten the benchmark hands down and with a significant margin. 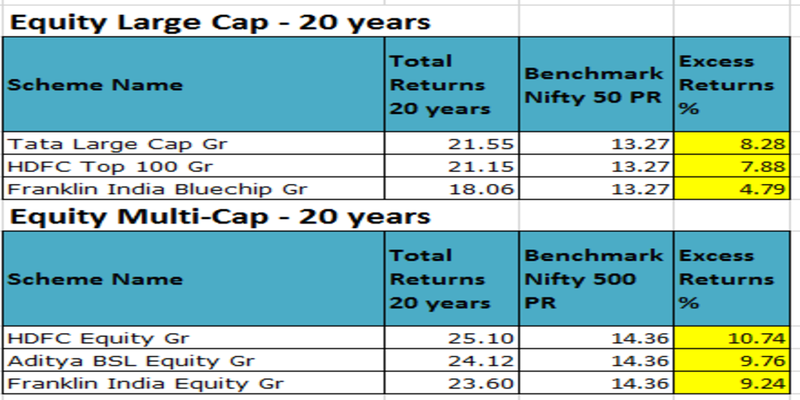 As seen in the table below, the top fund in the equity multi cap fund category, HDFC Equity (G) has outperformed the benchmark by a whopping 10.74% over a 20 year period. The actively managed funds have outperformed not just the benchmark indices but even the best performing index fund by a wide margin. The result is as clear as night and day. 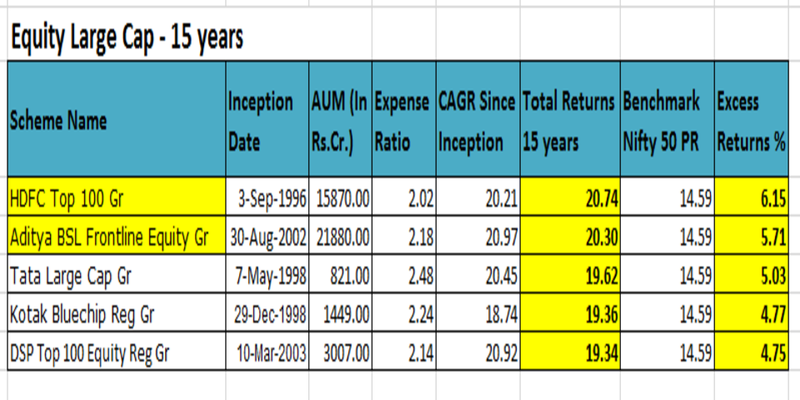 The absolute returns in the top 2 large cap equity funds is in excess of 16 lacs (1.6 million) over the best performing index fund over a 15 year period. It is also pertinent to note that the out-performance tapers off as we go down the list and for the 5th best fund the excess returns is actually less than 1%. This implies that you have to be get the fund selection absolutely right. Multi-cap funds by design may invest in mid cap or small cap stocks and that seems to give them an edge over pure large cap only funds. 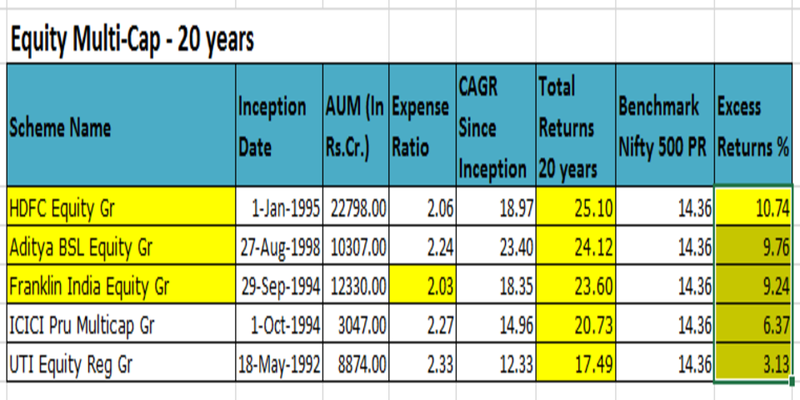 For Long term investors, multi cap funds may also be a good investing option. 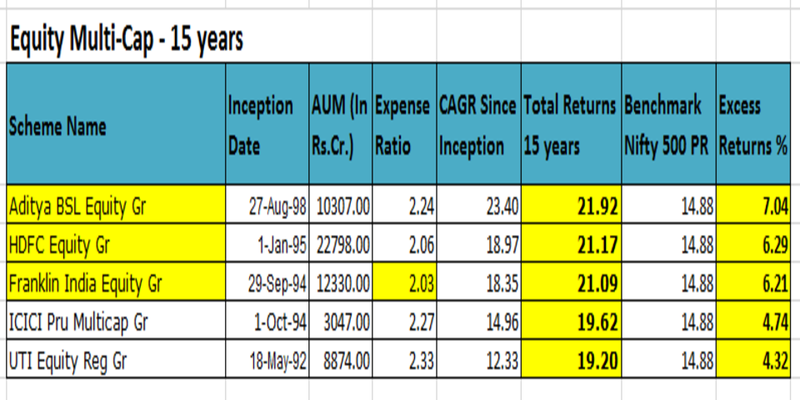 As can be seen above, over a 20 year period, the best performing Multi-cap fund (HDFC Equity Gr) has a 3.55 % out-performance over the best performing large cap only fund (25.10 % Vs 21.55%). 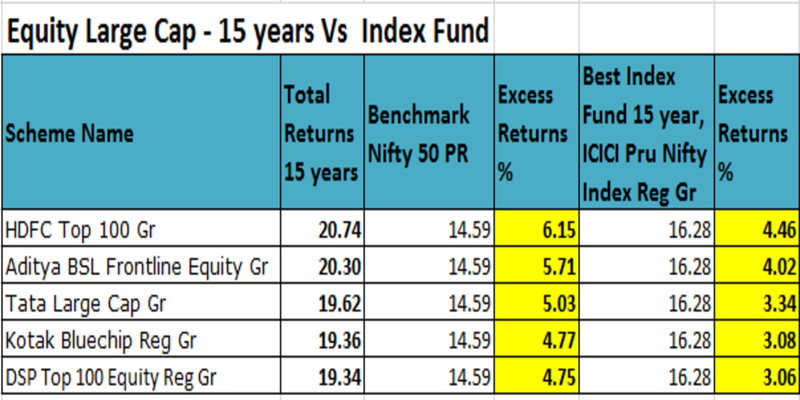 It is very clear to me now that at least in the Indian context, there are actively managed funds which have consistently beaten the benchmark indices and there is no need to jump into the indexing bandwagon. 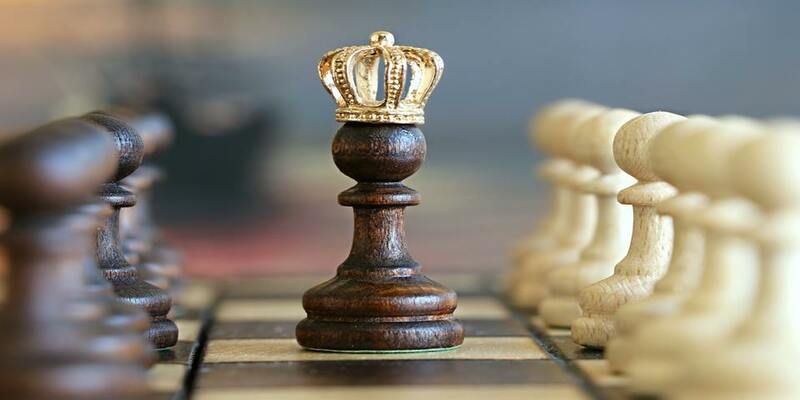 The best performing actively managed funds have not just outperformed the top index funds by a sizable margin and but also have done that over a very long time horizon of 15 to 20 years. However, as seen from the data, the excess returns generated seems to be tapering off as we go down the performance list. The key thing then is to get the fund selection decision absolutely spot on. Hitching your financial bandwagon to the right fund is seen to be crucial as to where you will end up in your investing journey. 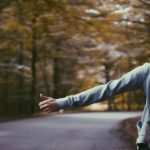 To that end, approaching a trusted financial adviser to help you choose the best fund may just be the fine beginning you can make.